As we previously discussed, few USB turntables offer gain adjustment before the signal hits the A/D converter (see chart #2 in the USB Turntable guide for specific models). Here's what I didn't expect: There's no way to adjust the recording volume in Windows Mixer or Audacity. Of course, you can always normalize after you're done recording. Nonetheless, I expected to find a slider in Windows Mixer, just like any other sound card. This could just be a limitation of the Microsoft's USB Audio CODEC driver (USBAudio.sys). I'm curious if Mac and Linux users have the same limitation. Then again, I tried Ploytec's USB ASIO driver and got the same results, so maybe it's the nature of the hardware. In the end, I guess you can always spin it in marketing terms: It's a feature- you never need to set your levels! With that, I present my first USB turntable sample from the Audio-Technica AT-LP2D-USB. It is the first track from the Ultimate Analogue Test LP. This 1kHz test tone is used for, among other things, setting the recording volume to read 0VU. Obviously, I cannot do this without post-processing. BTW, the first 10 seconds are the sounds of the tonearm automatically placing itself on the record. Many more samples are coming this weekend. Heh - it's peaking at around -6dbFS. If that's a 0db tone then I would be shocked if none of your needledrops clip with real music. What you find about no adjustment for the input level is true for just about every soundcard made, except gaming cards. Adjustment is always done in the analogue domain, before the sound card inputs. It woulld seem rather strange, and very poor design, for any USB TT to have clipping problems. That should be factored into the phono preamp specs, unless you change cartridges on the manufacturer..
Of the four albums mentioned in my "Preparations" post, Gorillaz clips throughout on the Audio-Technica. The rest play fine. Edit: I did find a single instance of clipping on Steely Dan's Aja, Side B. 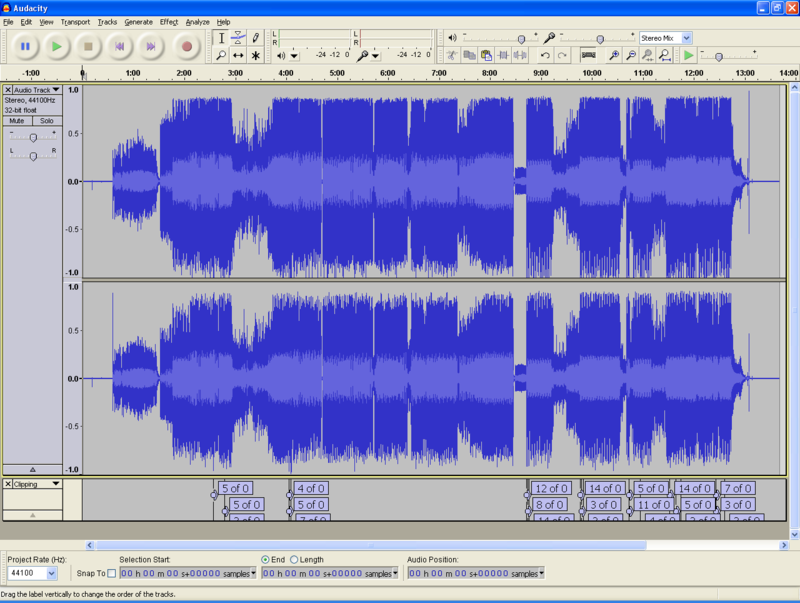 Here's the FLAC containing the clipping seen in the first screenshot. This demonstrates the worst case scenario stemming from a lack of adjustable gain: The music is clipping and there's nothing you can do about it. This 1 kHz reference tone will allow you to establish a "base level" for all measurements. I'm not sure what they mean by "in the studio" but I believe they intend the tone to be right at 0. Help me understand this better, if you don't mind. Every sound card I've owned in the last 10 years had two volume adjustments for the Line in. One is the "Playback" volume. The other is the "Recording" volume. I assumed the recording volume was a software adjustment made after the A/D converter on a traditional sound card. In any event, the recording volume is missing all together on the Audio-Technica and Ion TTUSB05 USB turntables (and I assume most others). Clearly it is preferable to have a gain knob before the audio hits the A/D converter. 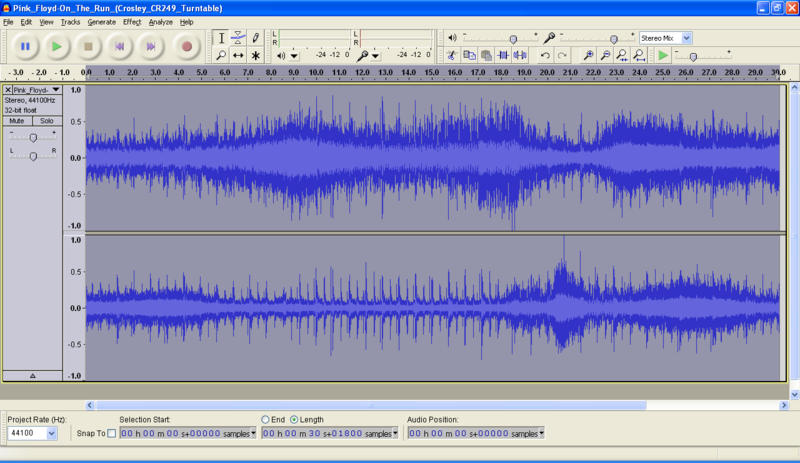 But what should I make of the lack of a recording volume control in Windows Mixer/Audacity? No chance of that with any of the turntables I'm testing. None have user replaceable cartridges. Microphone preamp inputs have gain adjustments on the input, some microphone preamps have level adjustments on the output. Al microphones need to use a preamp. Any soundcard/interface with microphone inputs has at least minimal adjustments -- for the microphone inputs. Line level inputs don’t go through a preamp on very many professional cards, although some of the “external audio interfaces” have full analogue mixing facilities built in. These will frequently have some way to route the line level input so at to least reduce input amplitude (in the analogue domain). Many soundcards have DSP mixer chips, especially PCI cards, that are used to adjust output level. On a fair number of these it is also possible to route the input through the mixer chip and thus decrease the amplitude. However, this is done post A to D, so cannot help with input clipping, but it can be useful if you are mixing that input signal with some other digital signal where the sum might clip in the recording program. The normal approach is an analogue mixer before the soundcard that can be used to make adjustments before the soundcard input. Some, perhaps many, PCI gaming cards do have an analogue level control but this is not true of very many professional cards (except those external one as described above). With a direct USB input, and no way to get at the signal between production (in the cartridge) and the A to D, still inside the TT, you are screwed. This is just one of the all-in-one down sides. Having an adjustment within Windows would be meaningless because the clipping has already occurred before the data gets there. One would think that it would not be too hard for the USB TT designer to have calculated what levels might reasonable be expected from LPs and made the phono preamp gain accordingly, so no clipping could occur, but that doesn’t seem to be the case with your particular sample. I suspect your belief that the cartridges are non-replaceable is just an misinterpretation of what you see. I’ve never seen or heard of such a thing. You seem to be confirming what I assumed: With the possible exception of some high-end sound cards, the so-called "Recording" volume you see in Windows Mixer is post-ADC (at least on the Line-in). It's perhaps useful for bringing the sound up from a low level. However, it is useless for eliminating clipping due to a strong signal on the analog side of the A/D converter. The fact that it is missing in Windows Mixer is of little consequence to making useful adjustments to the recording volume of a USB turntable. A handful of USB turntables insert a gain knob in the circuit between the pre-amp and A/D converter, generally on DJ USB turntables. The Pro-Ject Debut III USB does not have adjustable gain. This inexpensive part could save USB turntable makers a lot of grief from users who encounter clipping. Customers who don't know any better or don't care could leave the gain knob in its default position. Of course, this is a balancing act. Set the levels too low and you might lose audio data from weak signals. Again, more the reason to give the user the ability to make the adjustment him/herself. Actually, this comes straight from my conversations with Audio-Technica. We're talking about record players of $150 and less. There's no standard mount or any screws at all. The counterbalance is fixed. There is no anti-skate adjustment. I suppose you could chisel away at the plastic until you got the cartidge off and somehow affix the leads to a new cart, etc. but that's quite a hard hack for a TT that isn't worth the effort! Cartridges are not replaceable, but styluses are. I used to think this too, but got an Edirol UA-1EX recently and was quite confused to see the recording volume settings greyed out in Windows like in your screenshot. It has an "Input Volume" dial on the device itself, and according to the block diagram it's before the input goes to the ADC so I guess this is a much better solution than using the Windows Mixer. Quite shocking these turntables have no such control at all though! I wonder if there's any secret adjustable pots inside them? You feel like voiding your warranty? Vinyl reference levels are a somewhat complex and inconsistent field. When they mean 0VU they mean a "reference level" of 0db relative to some modulation velocity - and magnetic cartridges being sensitive to motion, a given modulation velocity translates directly into a given voltage on a given cartridge. Depending on who you ask, and what units you choose, and how much rounding is done, this is going to be one of: 3.54 cm/s, 5 cm/s, 5.5 cm/s, 7 cm/s, 7.07 cm/s, 8 cm/s, 10 cm/s, or 11.3 cm/s. 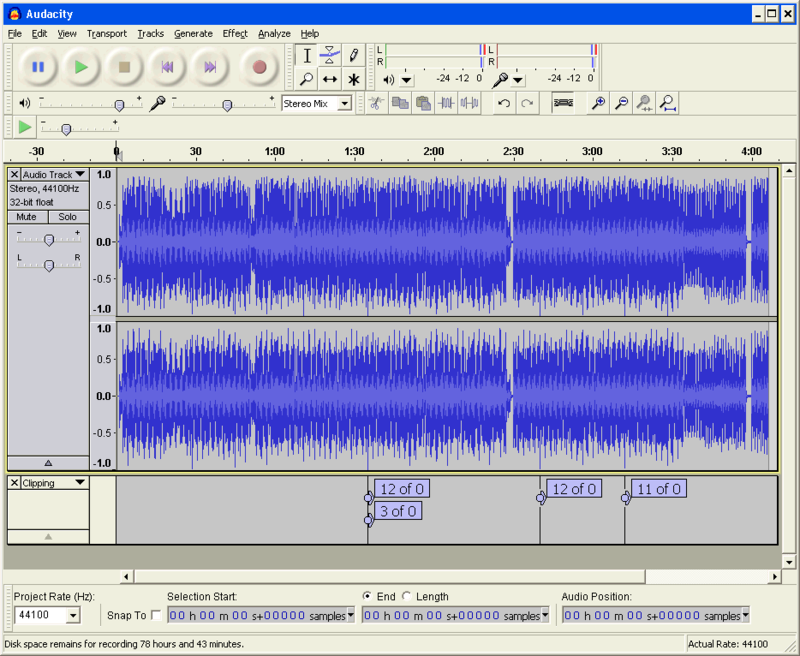 Different records are cut at different levels, where the "0db" point is artificially raised or lowered. Modern records, and especially singles, are cut at very loud levels - potentially far higher than the 0db of yore. It's quite possible that some turntable manufacturers haven't taken these levels into account and simply took the defined 0db as the "true" peak. A minor point perhaps, but I’ve never heard of any professional or semi-pro audio card that uses the Windows mixer at all. They have their own software control panel, designed by the card’s manufacturer to utilize its particular properties. These are usually installed with the drivers, and nothing in Window’s mixer effects the cards in any manner. The reason there is no software recording level control is a limitation of the USB audio chip these turntables use (a Texas Instruments 2904 or related). These chips have no software-adjustable level control and since the chip handles all USB communications, there is no way for the turntable designers to add one. Bizarre, is it not? I can only assume the chip designer was having a bad day. Digitally Attuning an already clipped signal is, of course, pointless and even destructive. However, I think there is at least limited utility in the ability to digitally amplify an weak signal in real-time. The recording is a prime candidate for normalization no doubt, but this requires an extra step. 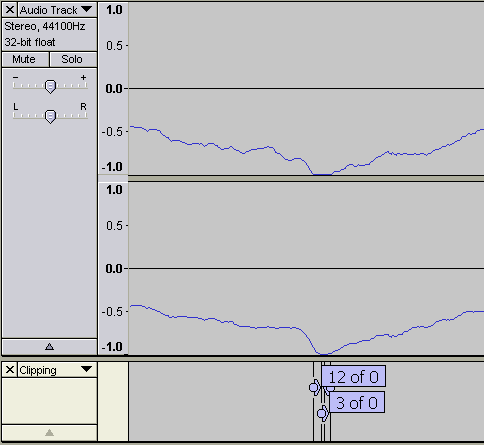 The "record-and-be-done" crowd could benefit from simple slider to "set the levels" to an acceptable recording volume. Rather than do it at record time, we offer a preamp slider in our graphic equaliser (which you apply after recording is complete). It doesn't matter when you boost the signal of course. All you've got to play with is the number of bits that came out of the ADC. Something else I noticed recently, incidentally, is that Vista (and Windows 7) actually *boost* the signal (in software) if you set their software-only recording level slider to maximum, often causing it to clip. We have therefore had to reinstate the slider in our software. Why on earth Microsoft made this change (they introduced it in Vista SP1) I don't know but perhaps, like you, people were complaining that their signal levels were too low. What is laughable is the amount of boost they apply. To get what looks like a direct signal path through all the cr@p they put in our way, one has to set the slider to 2 (yes, two) percent. It's all a bit irritating. Something else I noticed recently, incidentally, is that Vista (and Windows 7) actually *boost* the signal (in software) if you set their software-only recording level slider to maximum, often causing it to clip. Does this affect USB turntables with the TI 2904 family chips (with no sw adjustment internally)? It is fairly normal for a windows mixer setting of minimum but non-zero to correspond to unity gain. Whatever that means for what amounts to be a RIAA preamp is of course something that is what it is. 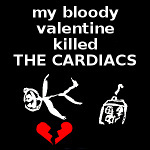 Sorry, slightly late reply: yes it does.